Special Dossier: A Bitter-Sweet Return. Reflections on the return of the bodies of Ehud Goldwasser and Eldad Regev. 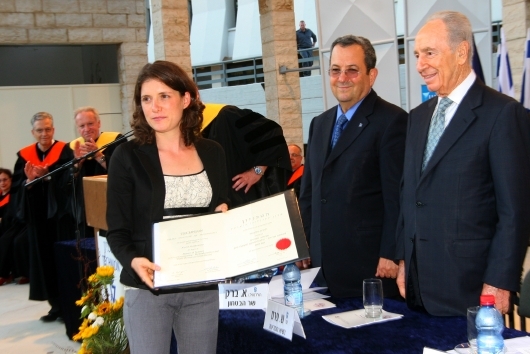 At the invitation of Karnit Goldwasser, the wife of abducted IDF soldier Ehud Goldwasser, Israeli President Shimon Peres and Defense Minister Ehud Barak were on hand June 12, 2008 for the Technion-Israel Institute of Technology's master's degree awards ceremony. Karnit Goldwasser received her degree in civil engineering with honors. "Today is a very difficult day for me," said Karnit Goldwasser just before the ceremony. "This degree is not dedicated to anyone ... we came together as a team, but Udi is greatly missed, just as he is missed on every Shabbat and on every holiday." . The ATS deeply mourns the death of Sergeant Major Ehud Goldwasser of the Israel Defense Forces (IDF), who was brutally abducted along with IDF soldier Eldad Regev by Hezbollah two years ago. Ehud was a brilliant graduate student in the Faculty of Aerospace Engineering at the Technion-Israel Institute of Technology. He was married to Karnit Goldwasser, who recently received her master's degree from the Technion, for only 10 months before his death. Ehud and Karnit planned to receive their graduate degrees together, in what would have been a joyful milestone in their history of love coupled with hard work. With great courage, Karnit went on to graduate with honors in June. Israel, the world, and we have lost one of the best, and our future is dimmer without Ehud and the important contributions he would surely have made. We are outraged by the inhumanity of Hezbollah's actions and express deep sympathy for Ehud's wife Karnit, his parents Shlomo and Miki, and the entire Goldwasser family. A Memorial Fund for Technion students in memory of Ehud Goldwasser has been established at the ATS. Editor's Note: The obituary above has been placed by the American Technion Society is major city newspapers throughout the United States. The Philadelphia Inquirer refused to print this as a paid advertisement claiming the last paragraph was an unacceptable "political statement." 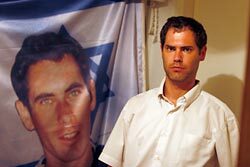 Eyal Regev standing next to a poster of his brother Eldad, an IDF reservist abducted by Hezbollah in July 2008. “The official announcement of Eldad Regev’s death is a particularly sad moment for the Bar-Ilan University and its American Friends division because Eldad was an outstanding student at the BIU School of Law who was looking forward to a promising career as a member of Bar-Ilan’s Law faculty,” said Mark Medin, executive vice president & CEO of American Friends of Bar-Ilan University (AFBIU). AFBIU extended its deepest condolences to the families and friends of Eldad Regev and Ehud Goldwasser, and once again called for the safe release of Gilad Shalit. Eldad Regev was particularly close to the hearts of the Bar-Ilan University community because he was enrolled as a Law student at BIU. He was preparing to take his final exam to be accepted to Bar-Ilan’s lower Law faculty when he was abducted in 2006 along with Ehud Goldwasser. “People knew of Eldad’s heroism on the battlefield, but they should also know he was equally successful in the field of academics. His senseless death is a loss not only to his family and friends – but to the entire nation of Israel . Everyone who knew him at the University was confident that he would go on to a great career in the Law,” said Medin. 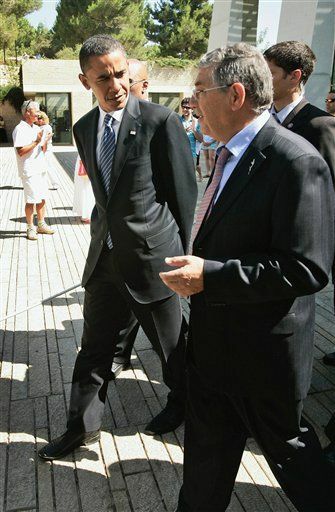 US Democratic presidential contender Barack Obama walks with director of Yad Vashem Avner Shalev in the Yad Vashem Holocaust Museum in Jerusalem in Jerusalem, Wednesday, July 23, 2008. "Today the people of Israel received confirmation of the deaths of two of their bravest sons, Ehud Goldwasser and Eldad Regev. Since their capture by Hezbollah terrorists in 2006, we have all held out the hope that they were still alive and would be coming home to their families, who campaigned so heroically across the world for their return. I was honored to meet last year with Ehud's wife Karnit and his mother Miki, who were visiting Washington on behalf of the Goldwasser, Regev, and Shalit families, and I offered them my hope and prayers and help. Today, Michelle and I offer the Goldwasser and Regev families, our deepest condolences on their loss, a tragedy no family should have to bear. In their time of extraordinary grief, an entire nation and friends throughout our country and around the world mourn with them. As they fought so hard for their loved ones' freedom, let us all reaffirm our commitment to win the freedom of the lone remaining Israeli solider held captive by terrorists, Gilad Shalit, so that his family can be spared this pain and welcome him back into their arms." Editor's Note: Following the return and burial of hostages Eldad Regev and Ehud Goldwasser, the Goldwasser and Regev families sat shiva in memory of their loved ones. Senator Barack Obama's visit to Israel coincided with their final day of shiva. Senator Obama used this opportunity to personally expressed his condolences to both families. After two years, Ehud Goldwasser (z”l) and Eldad Regev (z”l) have come home. We paid a heavy price for it. Was it the right decision? This is a case where there is no right or wrong decision. If my loved one was abducted, I would move heaven and earth and sell my soul to get her back. That’s exactly what we did. But what of the next four year old whose father is shot in front of her and then her skull is smashed until she no longer breaths and her mother who is hiding with her two year old sister accidentally smothers her while trying to keep her quiet so that Samir Kuntar doesn’t find them and kill them as well? To end two families’ suffering we will be causing another family to suffer. But the Goldwassers and Regevs can now have some closure and mourn Ehud and Eldad and our soldiers can be given the burial they deserve. Karnit Goldwasser may some day decide to remarry. Not a choice for Tammy Arad, whose husband Ron was taken 28 years ago. And what about the Rotshik family, whose son Zeev is missing since the Yom Kippur War, October 10, 1973? What about the Baumel, Katz, and Feldman families whose sons Zachary, Yehuda, and Tzvi have been missing since June 11, 1982, in a battle at Sultan Yakoub, in Lebanon? Or the Hever family whose son Guy was last seen at his army base on the southern Golan Heights on August 17, 1997? Or the Halabi family, who son Majdi was last seen on his way back to his base May 24, 2005? There is also the Schalit family who knows their son Gilad, abducted June 25, 2006, is most likely still alive but also know after the exchange today and very heavy price will be put on his release. Every parent cried today as if it was his or her own child who returned in a coffin. Not everyone agreed with the decision to release the murderers, but everyone understood it. From a security point of view it was a huge mistake. From a morale point of view, soldiers will know they will not be forgotten and the country will do everything possible to bring them home. I heard people saying today how proud they are of our country for doing everything possible and making impossible decisions to bring our boys home. But once again, we are asking ourselves, “What was it all for?” It was the attack and abduction of Goldwasser and Regev that sparked the Second Lebanon War, when Hizbullah crossed the border into Israel and attacked. Hizbullah has not been disarmed and is, in fact, alive and kicking and in control. It’s just a matter of time until Lebanon Three. I just hope and pray that we get Nasrallah and Kuntar in the strike and they suffer a painful death. I bought for Leora during Hebrew Book Week When the Shark and Fish First Met. It was written by Gilad Schalit when he was in 5th grade. Last November, it was published. It’s about a shark and a fish that meet in the ocean. The shark says he’s going to kill the fish and the fish suggests that they play instead. They go home to their mothers after and tell them about their day. The mothers forbid them from playing together. In the end, they continue to play together and their mothers accept it. It’s eerie that Gilad, who is now being held prisoner by the “shark” wrote this. I no longer have the hope that this book expresses, but I hope Leora will. We live in shark infested waters and most of them will eat us, given the chance. Tomorrow, Ehud and Eldad will be laid to rest. The families will sit shiva, but the whole country will mourn. In Lebanon, they are celebrating the release of a brutal murderer. What kind of people are these? Please pray for the safe and speedy return of the rest of our MIAs. To learn more about Israel’s MIAs, go to Facebook, The Israel Ministry of Foreign Affairs or Wikipedia.